Note: the region name colours may be badly readable. It will be fixed in the future. Head of State[? ]: His Imperial Majesty Godric, by the Grace of God Holy Luthori Emperor, forever August, King of Yishelem, Defender of the Faith . Cabinet: click here to view the cabinet. Click here for a comparison of the party voting records. For election history, click here. Click here to inspect the national budget. Walk upon Luthori's mountains green? On Luthori's pleasant pastures seen? In Luthori's green and pleasant land. The subnational divisions, also referred to as regions[? 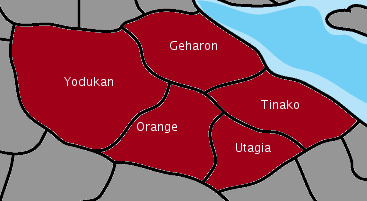 ], of the Holy Luthorian Empire (Luthori) are each referred to as a Duchy. To view the laws currently in effect, click here. To view the legislative history of this nation, click here. These bills are currently under debate[?]. These bills are currently being voted[?] upon.